JQuery Mobile has some nice form element replacements that are more mobile device/touch-friendly than the way browsers currently present form elements. One of them is the visual replacement for a checkbox. To be clear the ugly checkbox is still there, its now layered underneath the JQM checkbox art. Click here to see a working example. The docs IMO don’t quite tell you one critical thing – that certain tag attributes need to be identical in order for the framework to enhance the checkbox. If one of these is out of place you won’t get what you’re looking for. According to the docs the only thing to pay attention to is to ensure that the LABEL tag’s for attribute value is the same as the INPUT tag’s name value so that they are semantically linked together and displayed appropriately by the framework. There is one critical piece of information and that’s the INPUT tag’s id – it too must be the same value as the previous two attribute values. Omit that last bit and you don’t get any visual enhancement of the CHECKBOX element. As far as getting the label removed all that is needed (as can be seen in the code sample above) is to add data-iconpos=”notext” to the input tag. Lastly, I wanted to set the width so I added a class to the FIELDSET element and that was it, my check box was created and ready to go. 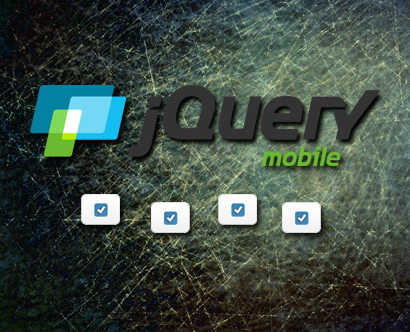 A handy tip is the use of the jQuery trigger method when inserting checkboxes into your document after it has loaded. Doing so ensures that you get the visual enhancement.